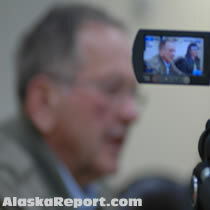 "Ted Stevens seems to be having another one of his YouTube moments"
By Dennis Zaki - Alaska's Republican senator Ted Stevens says New York's Democratic senator Chuck Schumer is running Alaska's Democratic Party. During a press conference Wednesday, responding to a question that the "Mark Begich for Senate" campaign implied that Stevens has had opportunities to push for regulating oil speculation but failed to do so, Stevens said "All of those people, why don't you ask em, um, who made up their, their lists of those comments to make about me, it's came out of Schumer. Schumer's office is running the Alaska Democratic Party." AlaskaReport contacted Matthew Miller, spokesman for the Democratic Senatorial Campaign Committee and he responded: "Ted Stevens seems to be having another one of his YouTube moments. Instead of attacking everyone in the country for his problems, maybe he should try just answering the questions Alaskans are asking him for a change." UPDATED - Alaska Democrats response: "Senator Stevens continues to refuse to answer Alaskans' tough questions. Instead, he dodges and distracts the public with conspiracy theories. It's wrong to think that anyone other than Alaskans run the Alaska Democratic Party. This is becoming a pattern - Stevens hiding behind expensive lawyers and national politics instead of answering questions about the FBI investigation and how he's paying his legal bills. We ask Senator Stevens to answer hard questions and take responsibility for his record," said Alaska Democratic Party spokeswoman Kay Brown. Mark Begich, later at a news conference announcing the formation of the group "Gun Owners for Begich," said Stevens could have cracked down on speculators years ago as chairman of the Senate Appropriations Committee but failed to do so, "He's a little late to the game on speculation. I'm glad he's now supportive, but it has cost millions of dollars to Alaska families over the last six years."